Who watches the watchmen's psychoses? 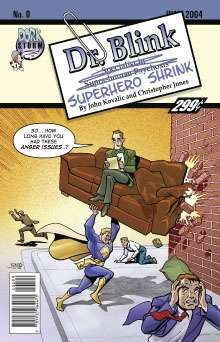 It's Dr. Blink, psychologist to the superheroes, of course! Part Bob Newhart, part Astro City, it's the hilarious bimonthly misadventures of the world's leading authority on metahuman mental health! But can a normal man fix his own life as he's helping the Earth's greatest heroes? By Dork Tower's John Kovalic and Justice League Adventures' Christopher Jones! Included: excerpts from the Dr. Blink bestseller, "Chicken Soup for the Super Soul"!